The world’s best marathoners hail from Kenya. The high altitude and moderate weather are ideal for optimal training. We had wanted to visit a high altitude training camp in Iten or Eldorat, but turns out that Nairobi was high enough for us lowlanders. Nairobi is situated at 5,800+ feet above sea level (around 1,800 meters), which is a little bit higher in altitude than Boulder, Colorado. If you are planning to head to western Kenya to the high altitude training camps, you might want to acclimatize in Nairobi first. Iten, Eldorat, and Nandi Hills are at 8,000+ feet! 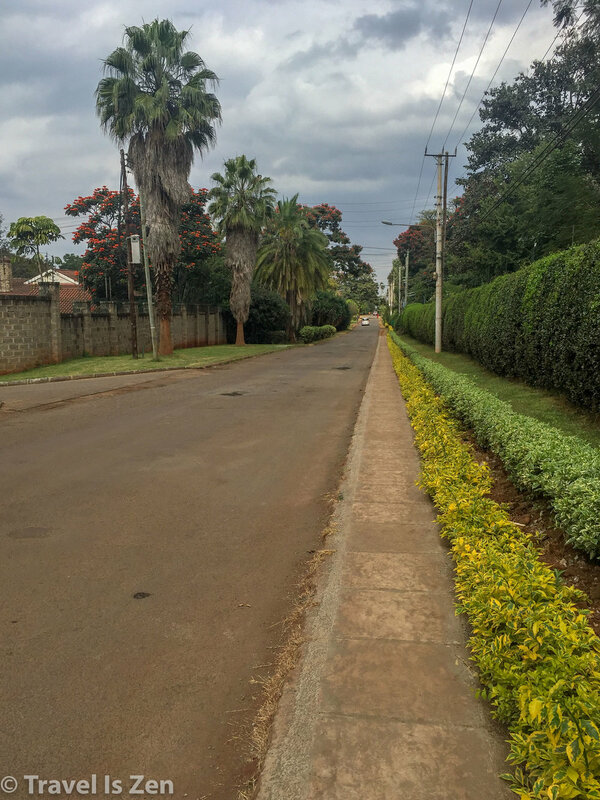 We were in Nairobi for about two weeks, staying in the Ruaka/Westlands area, northwest of the city. This is a nice area to run because the neighborhood streets are paved, some have sidewalks, traffic is light and the area is well-secured. This 5 mile out-and-back course runs through the Rosslyn and Runda Estates neighborhoods, which have mild hills. You can easily extend the distance by turning left or right onto United Nations Blvd. at the opposite end of Runda Estates. Some days, I would just run mile repeats in Rosslyn because it’s exactly 1 mile end-to-end and relatively flat. You can enter Rosslyn neighborhood from Rosslyn Riviera Mall on Limuru road. Just head up the steep hill directly across the street from the mall entrance. Karura Forest is also located in Westlands. This is a terrific place to trail run, but there is a USD$6 daily entrance fee. Another running option is along United Nations Boulevard for an aggressive hill workout. It has a wide sidewalk and long climb! Happy huffing!